It was a busy day. Rob ran the Firecracker 5K this morning, and William and I walked over to watch. I was in a really bad mood because Will would not take a nap, but he was very tired and kept crying and pummeling me with his fists. I was also in a bad mood because I wasn't running the 5K myself. The thing is, I didn't actually want to run the 5K (I hate 5K's, and this one in particular because the course is usually short and makes you think you are better than what you really are), but I wanted to be able to run the 5K, you know? But that is a whole nother issue that is beyond the scope of this blog entry. In the very brief amount of time between the 5K and the annual 4th of July parade, I managed to get William to eat some cauliflower and pieces of whole wheat pita. His eating is still hit and miss these days. I am trying all sorts of random things to try to come up with something he will eat. A few days ago it was prunes. Yesterday it was mango. Who knows what it will be tomorrow. 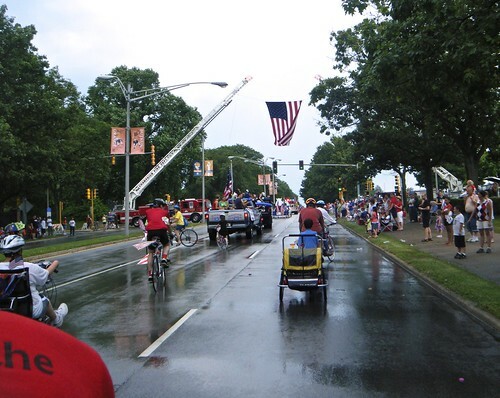 Then we all piled onto Big Red (our tandem bike) and road over to the parade staging area. 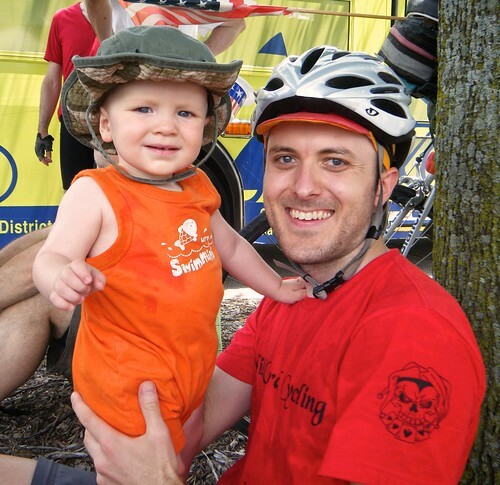 We were going to be riding with the Champaign County Bikes, as we have done in years past. It was about 900 degrees out and 900% humidty, and we waited and waited for the parade to start and for our turn to go once the parade had actually started (we were #78). As we waited and waited, I realized it had been some time since William had nursed, and I started to worry that the parade itself would take so long that he would get hungry. So we popped him out of the Burley and I carried him to a tree to sit in the shade and nurse him (add "Parade Staging Area" to List of Strange Places Where I Have Nursed the Baby). As I was doing so, the sunny sky turned black and it began to pour. It was literally raining on our parade. Everybody was kind of stunned. Not knowing what else to do, I just sat there, under the tree, continuing to nurse the baby. We were all wondering what was going to happen. The parade was already underway (some 50 floats had already taken off)... would they stop it? I'm not sure how long the downpour lasted, but eventually it dwindled, and then just about the time that it was our turn to go, it stopped. About midway through the parade, it was bright and sunny again. Weird. 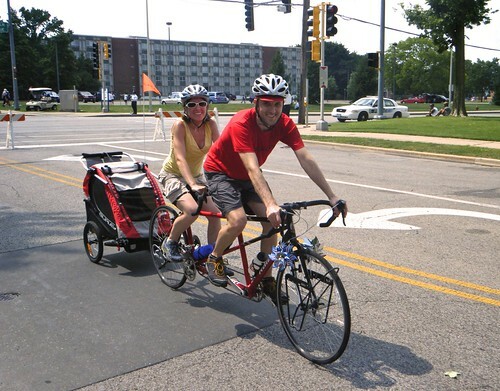 The best part of the Champaign County Bikes, in my opinion, is the "Jazz Cycle" (I think that is what they call it). 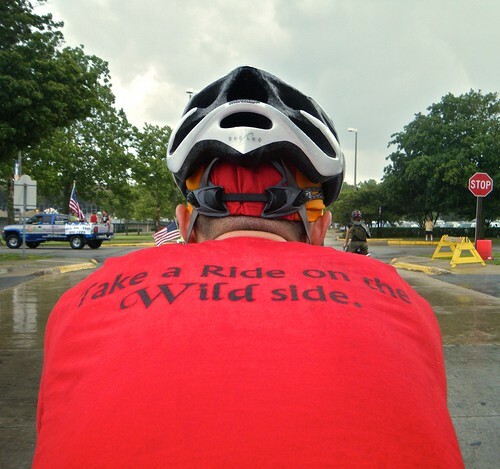 It is a side-by-side tandem recumbent, and the riders (one of whom is our neighbor) play instruments and sing while they ride. It is always a hit with the crowd. As we were all riding by, I heard one of the parade spectators clap for the Jazz Cycle and say, "Well now I've seen everything." The Jazz Cycle. Note how the guy gets out a piccolo at the end. A close second to the Jazz Cycle is the lady who has attached a blender to her Xtra Cycle and makes smoothies as she rides. I love living in Champaign-Urbana. 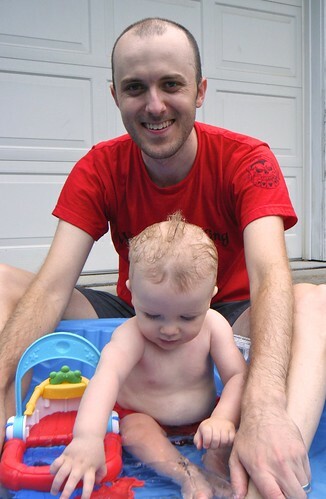 Before we had left for the parade, we had set up the kiddie pool I recently bought for William. By the time we returned, the water was nice and warm, so Will had a little swim. Then we went to a neighborhood cook-out, where William was, as usual, the star of the show. We skipped fireworks this year, since William goes to bed around 7:30pm (and we were all kind of tired). We can always do fireworks next year.